Cranberries and chestnuts make this a special holiday treat. The chestnuts are pureed with sugar and vanilla to give a sweet nutty flavor. Put the cranberries, the cup of sugar , water in a saucepan and cook the cranberries until they have popped and some of the liquid evaporated. At the end, add the liquefied cornstarch and stir vigorously as it clarified and becomes very thick. Remove the cranberry mixture from the heat and allow to cool and solidify. Meanwhile, in another small saucepan gently heat through the chestnuts the 1/4 cup soy cream for 2-3 minutes. Add the vanilla and 1/2 cup sugar. Puree the chestnut and chocolate mixture to a thick mass. In a large bowl, whip the soy whipping cream or Soyatoo with the icing sugar to soft peaks. Transfer the chestnut and cream mixture to a blender or mini food processor and blend to a puree. 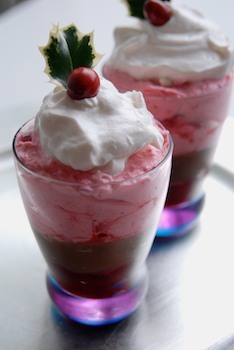 Place a small amount to the cooled cranberry mixture in the bottom of a parfait glass. Put a layer of the chestnut puree over the cranberries. Mix half of the whipped soy cream with the remainder of the cranberry mixture. Place this layer over the chestnut layer. Top with a dollop of the whipped cream. 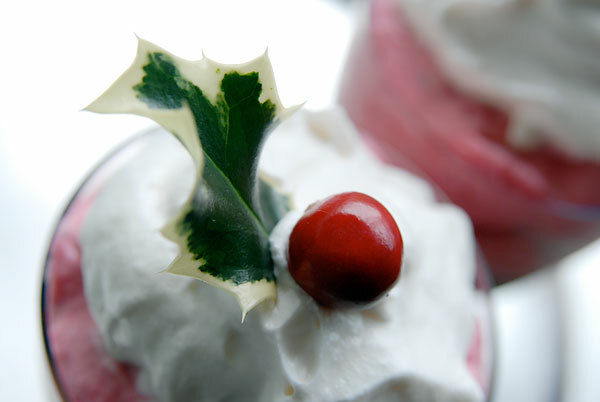 Garnish with a cherry or cranberry and perhaps a holly leaf. Optionally chocolate can be melted and added to the chestnut mixture, and a dusting of cocoa as a garnish. If you are able to buy pre-made chestnut puree, then that would make this recipe even quicker and easier to make. Posted by Chris Walker on December 30, 2007 in Chestnut, Cranberry, Desserts and Sweets.